Borders MSP Rachael Hamilton with ScotRail boss Alex Hynes. MSP Rachael Hamilton is calling on Borders Railway bosses to improve reliability on the 30-mile line following the publication of the latest in a series of below-par performance figures. The Ettrick, Roxburgh and Berwickshire MSP met ScotRail managing director Alex Hynes to demand improvements on the Tweedbank-Edinburgh track and says she was encouraged by the response she got. “Meeting Alex Hynes was a good opportunity to iron out problems that many have faced over the past few months,” she said. 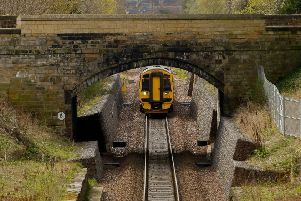 “I was glad he gave me reassurances that improvements were being made on the Waverley line service, with better reliability and more carriages during peak times. “Hard-working commuters and passengers deserve better. “Borderers have borne the brunt of the worst of the delays and cancellations, and many of my constituents are simply fed up of the poor service from Tweedbank. “I am glad I had a chance to meet with Alex Hynes and was pleased to receive an apology for the number of disruptions and cancellations. The public performance measure moving annual average figure for services arriving at Tweedbank within five minutes of their scheduled time between December 9 and January 5 was 86.2%, down slightly from 86.3% the month before. Mr Hynes said: “This has been a challenging time for Scotland’s railway. While we know that our performance has not been good enough, it is encouraging to see our punctuality continuing to improve across the country. ScotRail has also come in for criticism after Transport Focus, a passenger watchdog, published the results of a survey showing that customer satisfaction among travellers has fallen to its lowest level since 2002. Some 1,200 ScotRail customers were surveyed by the watchdog, and only 79% said they were satisfied with their journeys last autumn. “I am not remotely surprised at the findings from Transport Focus. They make for grim reading,” said Mrs Hamilton.